Nick Warren. Discography. Music. Albums. Tracks. 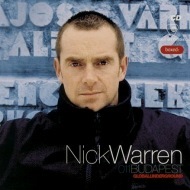 Nick Warren is an English house DJ and producer. A number of his mixes have been released as DJ-mixed compilation albums including the famed Global Underground series. He is a member of electro/prog duo Way Out West. Currently, he is a head of the progressive house and breaks record label Hope Recordings. Over the past six years, Nick Warren has developed into one of the world's most consistent performance artists. Firmly established both as a DJ and as a producer, Nick's reputation took him futher and further a field. Now one of the UK's most in demand DJs, Nick spread his unique funky trance sound up and down the British Isles and across the globe. Constant DJ tours across the globe for Renaissance, Cream and the Tyrant - Balance crew and live appearances as Way Out West have firmly established Nick as a genius in the progressive house arena. Warren has come to be mentioned in the higher echelons of house and electronic music, alongside such figures as John Digweed, Sasha and Dave Seaman. He made the well-trodden journey from trance to progressive trance to progressive house, and his numerous Global Underground releases are a faithful indicator of his progression and maturity as a top DJ. Global Underground has received much work from Warren, whose outings on the established Back to Mine and Renaissance series are his only other releases of note.